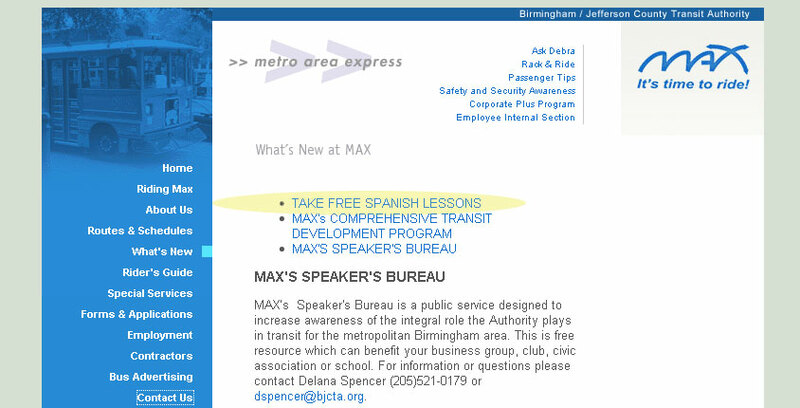 Learn Spanish… from the bus system? Screenshot of bjcta.org What’s New page, accessed 9.16.2008. Not quite, but yes! It was a little weird when we visited the BJCTA’s (a.k.a. our bus system’s) website earlier today while getting ready for the Tuesday morning City Council post. We went back later to check on it; the item posted at the top of the What’s New items section of their website is a link that takes people to another site, Learn Spanish Today, that offers people to take free Spanish lessons – via a widget dictionary that can be installed on your website or blog or another link on the site. Before you ask, yes, we did email the BJCTA about the link – we hope to share their response with you soon.